Lessons Only – 1x 30 Minute Lesson per week (17 total). 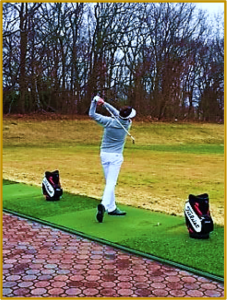 Practice Only – 1x 30 Minute Practice Session per week (17 total). Lessons & Practice – 1x 30 Minute Lesson and 1x 30 Minute Practice Session per week (34 total). The Winter Lesson Package runs from December 1st, 2018 to March 31st, 2019 and entitles you to whichever package you choose to purchase. What’s Included in Winter Lessons? All Winter Lessons Program will be performed indoors, so the most important tool is the net unit. Nick uses the Net Return Pro Golf Package. This net is handcrafted in the USA using lightweight, rugged, 1.5” tubular aluminum frame. The Net Return comes with a commercial grade, UV treated polyester netting and a large 6 feet wide x 10 feet long nylon ¾” thick turf. The unique part of this net unit is that on better weather days, Nick will turn you around and hit outside to see if the ball flight replicates the improvements on the launch monitor. All lessons and practice will be performed using Flight Scope launch data. This data will be displayed on a TV monitor (above), so that instant feedback can be obtained. 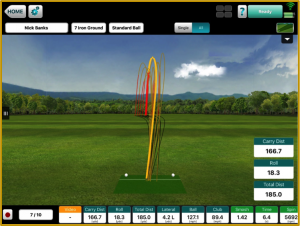 Using ball flight and launch data can help you to understand the reasons for either poor fundamentals or poor swing technique. The more practice that is done after lessons using launch data, the more knowledge the student gets. This can further help the understanding into what caused a certain mistake, what needs to be done to improve it during your next lesson or practice session and why it’s important to do so. Nick has been using V1 Golf Analysis for over 15 years. Using video to show strengths and weakness is very important in golf instruction, especially when it’s done indoors. 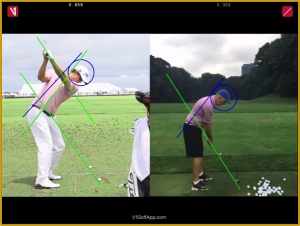 Comparisons to correct movements and highlighting certain positions during the golf swing can reinforce trust in the changes being made. Most of us are visual learners and V1 is at the pinnacle of visual learning. V1 will be streamed during the lessons for immediate feedback of each swing so that correct movements can be mastered quicker. 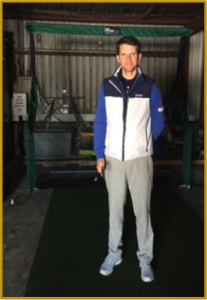 For those that don’t know Nick, he is an experienced PGA Teaching Professional with a wealth of knowledge in all aspects of the golf swing. His focus is to establish, correct and maintain your swing’s ‘Root Cause’ to help improve your overall level of ability, knowledge and understanding. For more on Nick’s background please click here. For more information contact the pro shop at (631) 751-0585.